Making a name for himself in the 1990s, Maritime-based fiddler Ashley MacIsaac became a household name after several late-night talk show appearances and Juno wins. Accompanied by his band, dubbed Cape Breton's Finest, MacIsaac brought traditional east coast music to the prairies with updated interpretations of his original works. 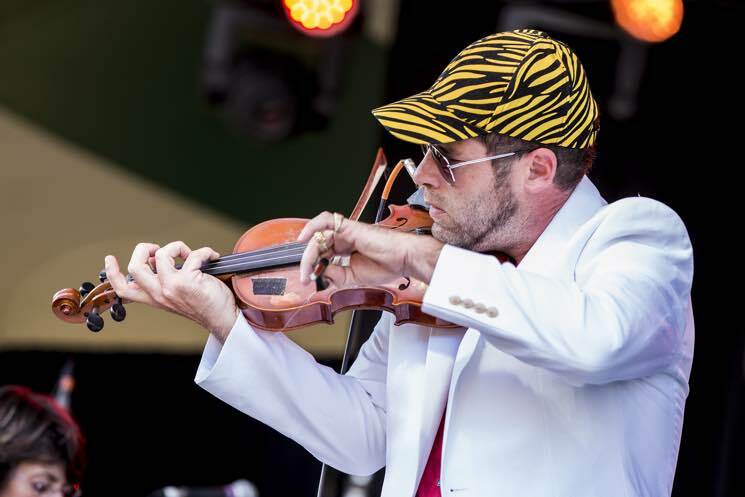 His bright white suit and yellow-and-black zebra-striped baseball cap turned heads, but MacIsaac wasted no time reminding the audience of his incredible skill with a fiddle. Through rapid and intricate playing, MacIsaac's fiddle screeched and screamed, while his bow frayed from the accelerated pace of the performance. MacIsaac only paused for brief moments to talk about his musical influences and to speak highly of the musicians sharing the stage with him — who also got a few moments in the spotlight. Toward the end of the set, MacIsaac and percussionist Jay Andrews (a.k.a. Sticks) performed a mash-up of modern hip-hop beats and traditional fiddle music. The unique take on two seemingly far apart worlds was executed exceptionally well. MacIsaac finished the song with a ferocious solo that exhibited his ability and endurance, receiving a standing ovation from the sizable crowd.